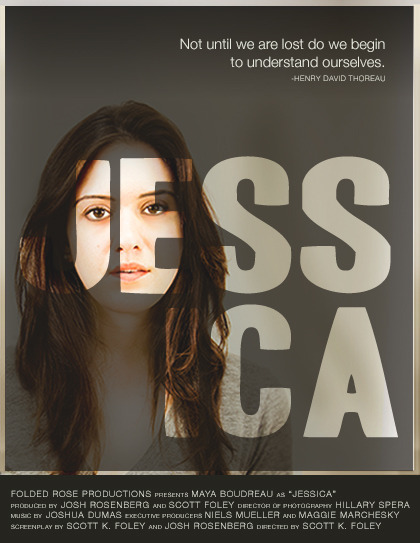 The poster for the Chicago film "Jessica," starring Maya Boudreau and directed by Scott K. Foley. Poster for the Chicago indie film "Jessica," directed by Scott K. Foley. 2012 ended on a five-year low for female roles at the movies, with box office blockbusters dominated yet again by hunky male superheroes and women as mostly eye candy on the side. The simple truth is that Hollywood films rarely feature a women in a starring role—i.e. not just as a love interest for the male lead, but as a genuinely complex and multi-faceted character who is at the center of her own story. Thankfully, an exciting new work from Chicago-based writer/director Scott K. Foley aims to close the gender gap. Jessica is a coming-of-age drama about a troubled 24-year-old, played by Steppenwolf actress Maya Boudreau, who has no idea what to with her life after college. Sound familiar? The tagline on the film&apos;s Kickstarter page (the creative team behind Jessica is currently halfway to their funding goal of $25,000, with only nine days left) also echoes the sentiments of a millennial generation in crisis: "a movie for anyone who has felt a little lost." Of course, this premise is ripe with relatability for the Girls-era of struggling female twenty-somethings; but with the exception of the splendid Frances Ha (which premiered earlier this summer to very little fanfare), a cinematic story like this one has been hard to come by in recent years. Audiences remember films like these because they really are so uncommon, especially on a big-budget scale. Also, women long for lead female characters like Bridget Jones, Muriel Heslop and Annie from Bridesmaids because they are messy, complicated and, above all, relatable. Perhaps the scarcity of films with female leads is due to the fact that women make up only nine percent of the directors in Hollywood, and the majority of male directors prefer making films about men. In addition, the "safe" popularity of superhero movies and testosterone-powered action flicks (which usually only show women clad in skintight bodysuits or bikinis to satisfy the male gaze) may be why studio execs keep pushing the same male archetypes on to blockbuster audiences year after year, instead of giving more female-fronted films a chance. Hopefully, more films like Jessica will continue to challenge the status quo, and prove that stories about women still deserve to be seen, heard and celebrated.